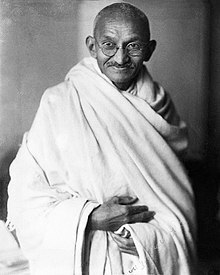 English: Mohandas Karamchand Gandhi (1869-1948). Round Table Conference in London and trip through Europe (France, England, Switzerland, Italy). with Mahadev Desai (left) at Birla House, Mumbai (7 April 1939). Gandhi at the telephone, Segaon, 1939. Gandhi spinning, at Birla House, New Delhi wearing a Noakhali hat, 1947.
at Birla House, New Delhi, 1947. Letter of Gandhi to Tolstoy, Johannesburg, April 4, 1910. Envelope of a letter sent by Gandhi to Tolstoy, Johannesburg, April 4, 1910. Newspaper published by Gandhi in South-Africa, 1913. Gandhi's Appeal, Young India, May 10, 1919. The Bombay Chronicle, July 30, 1921. Court judgement on Gandhi, March 18, 1922. Gandhi's handwriting, left hand, 30 September 1925 (Letter to J. Nehru). Letter to R. Tagore, 31 January 1926. Gandhi's handwriting, right hand (Letter to J. Nehru). The Bombay Chronicle, January 26, 1931. Gandhi's letter to R. Tagore, January 3, 1932. Caricature of Gandhi in jail with Lord Willingdon, between 1930 and 1932. Gandhi and Lord Willingdon caricature, 1932. Gandhi's letter to Hitler, July 23, 1939. Gandhi's Newspaper, Harijan, September 23, 1939. The Bombay Chronicle, September 29, 1939. The Bombay Chronicle, 193. ? The Bombay Chronicle, 1941 ? This page was last edited on 31 March 2019, at 21:30.